Heard it time and time again this summer " if you find the debris you will find the dolphin" . To me that means a long day of searching and they may even have summertime "lock jaw" when you find him. Had 14 year old Austin and his brother Jessie on the boat with me last night. His mom booked a trip for him to catch his first dolphin, he even went out and bought a new "dolphin shirt" for the occassion from World Wide, it was nice and white. Forgot what a what a new "white shirt" actually looks like. I called his mom and told him that we would not be doing an early morning trip, but rather a late in the day trip, as the dolphin bite was extremely slow so I wanted to change it up and go at night and see if I could find the fish at dark. I told her I would do my best to catch him his very first dolphin, talk about pressure(laughing). Hit the reef first for Yellowtailing, he did not seem to like yellowtailing one bit, as his mind was "dolphin". I made the mistake of having the radio on at 4:30 PM, sweating to the oldies and I mean really sweating under the heat on the reef. Capt. Skip's fishing report came on he said "no fish" for him and the ones he did find would not eat. Austin heard the report, put his Yellowtail pole down and went to the front of the boat and sat down with a blank stare, you could just see dissappoint it in the kids face. His brother was passed out from Dramine that his mom gave him before he got out on the boat. At 5:30 PM, pulled the reef gear and decided to give it a try and was hoping the fishing gods heard my pray to catch this kid a dolphin. At 7:30 PM, the sky clouded over so I decided to fish an area north of Molassas in 270ft. At 7:45 PM, the short left snapped hard and there she jumped. Did not mess around and got the nice cow in the boat quickly. Austin got his first dolphin. Turned the boat in for home at 8:15 PM. Austin's white shirt was no longer white. What a trip and the beer tasted cold at dock. Well Done! Really a lot of pressure when a young angler and his Mother are fully expecting you to find fish. Hero's Don't Wear Capes....They Wear Dog Tags. Honestly, is there anything better than putting a kid on a nice fish? GREAT job!! Pretty bold move fishing late. I don't think a lot of folks do that and I've always wondered how consistent it might be. This time of year I tend to move towards the night bite when the phin fishing has been consistantly slow. The phins are loaded with triggerfish(lockjaw) right now as they were at the exact sametime last year. You are exactly right Captain, the schoolies that we did get on board Thursday were puking small triggerfish. Not hit or miss but worship to the gods of fuel (80 to 100 gallons some days but the results are most rewarding along with depths close to 3000 foot) this time of summer along with an early starting time while the water is still cool and the fish are active. A really good pair of field glasses helps along with the first mates eyes of a hawk. With the gulf stream over 16 miles from the reef line I dont even start to look around untill 600 foot of depth. Caught very little on derbris as the migrating larger fish were my target as they move in samll packs (bull and his cows). Slick calm days with no wind do not produce a steady bite. Every peice of weed and debris is filled with bait and lots of smaller dolphin! 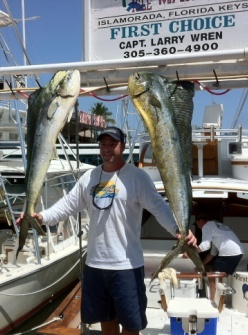 We manged some nice fish last week but it took a lot of hunting to find them. I think it a matter of the "Right Piece of Debris along with putting the miles in". Nice catch and I am sure that young man was very happy! 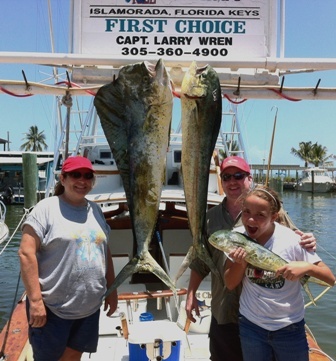 We had this young lady reel in the bull for her first ever dolphin Thursday last week. I don't usually carry a spear when I'm offshore. Does a flare gun work as well? Great report. Even I felt bad reading about him in the front of the boat. I could just imagine the look on his face when that dolphin hit. Good Job, Capt. You made that kid's trip! MAybe a reason to start bringing a gun? i felt the same way reading the story. Great job! Great catch Larry! Very nice. Great job. There is nothing cooler than a kid with a smile on his face while catchin a fish.